Bilateral and unilateral contracts are the two most contracts entered into for personal or professional reasons. 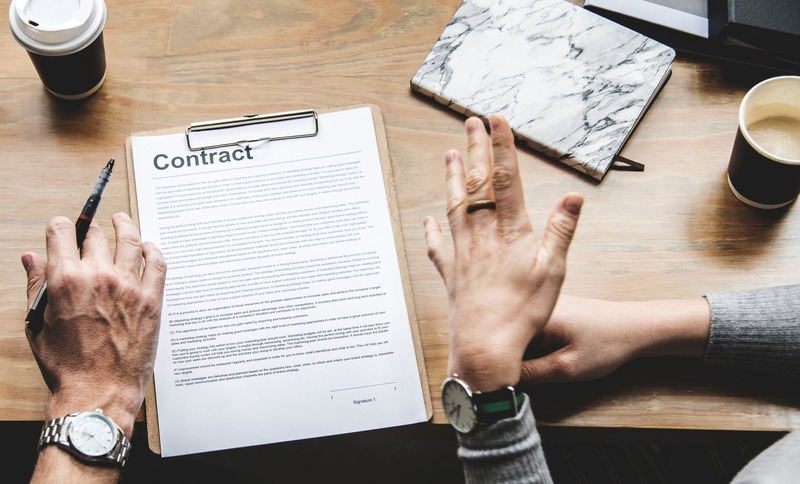 Many people, however, do not know the key differences between these contracts of which knowing such differences could help one from a legal standpoint. 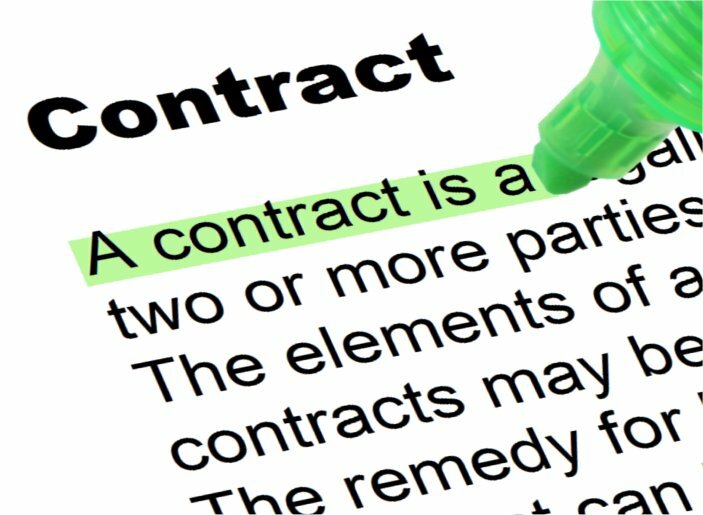 Both contracts are enforceable by law, whether written or oral. These contracts are different in many aspects and we shall highlight these differences below. Bilateral contracts are the predominantly known contracts signed between businesses or individuals to honor certain deliverable. The word “bi” means two, which simply means an agreement entered into by two individuals or groups. The contract is active the minute the two parties agree on certain conditions and sign the contracts. Examples of a bilateral contract could include a purchase of a car. The buyer and the seller gets into a bilateral contract where the seller issues the car upon a receipt of the money. A contract and the homeowner also gets into a bilateral contract where a contractor is tasked with the job to complete and the owner pays the contractor for the job done. In simple terms, there is a promisor and a promisee. A promisor promises a reimbursement for the performance or deliverable and the promise takes action in order to be reimbursed. Unlike unilateral contracts, there could be a prepayment in bilateral contracts. Bilateral contracts are often referred to as “reciprocal”, which means they are equally binding on each involved parties. If one party fails to honor the promise upon which they had agreed, it will be considered to be in breach of the contract and thus legal steps could be imposed. The other party has to prove to the court that the contract has indeed taken place, what are the inconveniences suffered and what is the loss attributable to the breach of the contract. Although difficult to handle, oral bilateral contracts are equally enforceable by the court. The word “uni” means one, which means a single party being obliged to honor its contract. Unilateral contracts are not as common as bilateral contracts between businesses, but are nonetheless often carried without the knowledge that they are purely unilateral. A unilateral contract is binding to only one person, the promisor. The best example of unilateral contracts can be a reward by a promisor to a promisee that they will receive a certain amount of money if they can find a lost dog. The promisee is not obligated to honor a unilateral contract. It is until the promisee starts the action of the deliverable that the contract is valid. Bilateral contracts can also have some elements of unilateral contracts in them. If a promisor issues a request in a unilateral contract, anyone can decide to honor unlike with the bilateral contract where the contract is entered into by specific groups. The promisor would be in a breach of a contract if they do not compensate the promisee for honoring the deliverable. Rewards are always associated with unilateral contracts because only the promisor is legally bound to honor the promises. Insurance contracts, also, have elements of unilateral contracts where the insurance company can promise to compensate the client in case they encounter a certain event. If that event does not occur, then no compensation. The same with rewards, if the promisee does not, for example, find the dog and bring it, there will not be any reward. Unlike the bilateral contracts, a unilateral contract only starts upon delivery. Thus, no prepayments are warranted with unilateral because the promisee may take the money and fail to deliver. Oftentimes, unilateral contracts can be adjusted with time. For instance, if the promisor promises a reward for anyone to find and bring his lost cat within a week, they may offer an incremental value. Bilateral contracts, on the other hand, have fixed dates. If the other party fails to honor the due date without legally reasonable justifications, the contract may be considered to be breached. Although they are both legal contracts, the number of participating parties in these contracts differ. As already highlighted above, a unilateral contract entails only one party being obligated by the law to honor their promise to the promisee. Such a promise remains open until a willing party comes onboard to take action for a reimbursement. With a bilateral contract, two individuals or two groups are legally bound to participate. It is a reciprocal contract meaning the two parties have the responsibility and the rights in the agreement. In a bilateral contract, the other party is paid for the performance or deliverable done as agreed upon according to terms and time frame. A prepayment can be done upon signing the contract, and the other party is bound by the law to honor the terms of the contract. Unilateral contracts can offer rewards for any willing promisee. There are no rewards with bilateral contracts. Time elements also distinguish between unilateral and bilateral contracts. For instance, a bilateral contract has a fixed time and if the contractor fails to meet such a deadline, the contract may be considered a breach. Both parties are accountable are responsible to meet the deadlines. Unilateral contracts, on the other hand, have no binding deadlines. The promisor may set a certain time frame and then extend it with an increment on the initial reward promised to the promisee. Lusi Madisha. "Difference Between Unilateral Contract and Bilateral Contract." DifferenceBetween.net. 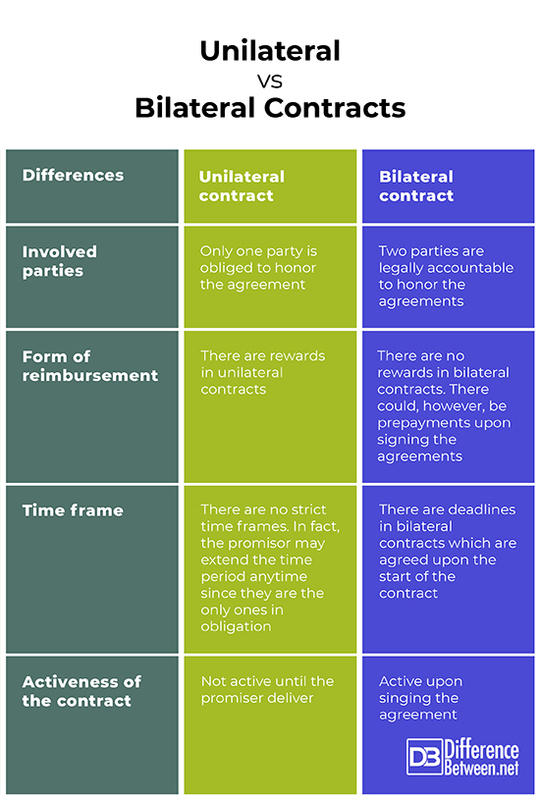 January 29, 2019 < http://www.differencebetween.net/business/finance-business-2/difference-between-unilateral-contract-and-bilateral-contract/ >. Riordan, M. (1982). Bilateral contracts and asymmetric information. Philadelphia, Pa: University of Pennsylvania, Center for the Study of Organizational Innovation. Blum, B. A. (2004). Contracts: Examples and explanations. New York: Aspen Publishers.